Hey there! I think this program is incredibly cool, especially for experienced coders. 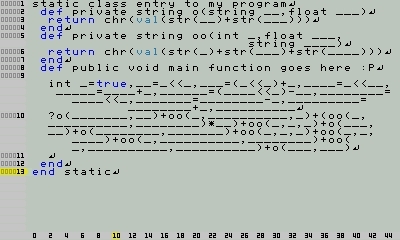 However, I believe a good way to learn the language would be to use an inverted compiler. Instead of N# to SmileBasic, it could be SmileBasic to N#. That way, newer programmers like myself could learn how to program the simple programs we made in SmileBasic on N# as well! The purpose was to let experienced programmers use an OOP language and still be able to run their code in the SB app. However, N# is no longer an active project, mainly in part due to its bad design (it's honestly a very bad OOP language). I appreciate your feedback though! Is there any way I can return a value other than void, string, or int? Like, if I were to have created a class called Byte, is there any way I could perhaps create a function similar to this? def public Byte convIntToByte(int in) object ret <- Byte = in return ret end or maybe just return any object in general?